I look forward to a Busy Monday morning treating patients with Herniated discs. Many of my patients that decide to treat using the DRX 9000 have been everwhere. Most of my patients have had Physical therapy, Pain management, Lidoderm patchs, Failed Back surgery, and some have even tried hypnosis. The reason so many patients have problem with the disc is the fact that the disc is avascualar(no or diminished blod supply) and once it is injured it doesn't quite heal that easily. Orthopedic Bracing, and Core Strengthing Excercise. When this combination is utulized corectlly back pain stops in its track! 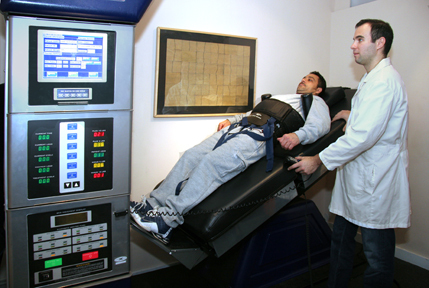 If you are in Metro Manhattan and are considering Spinal Decompression my first recommendation is to find a doctor that is close to you ( you will be going in 4 times a week) and Nutrition support like Omega Fatty acid should be taken daily. As a general recommendation I urge patients to drink One glass of water for every hour they are awake. 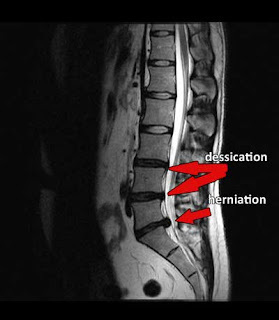 Disc Dessication is break down of the annular fibers due to dehydration.